For us architecture is not just a profession, but a vocation. Our professionalism, diligence, timely delivery, and responsibility to the task are only some of the reasons to select us as a partner in realizing the architectural idea. Our understanding of contemporary architecture is influenced by the development of modern technologies and the introduction of digital design in everyday design work. Our work draws inspiration from "hi-tech" architecture of the West and the Far East, adapted to the architectural traditions of Bulgaria. In each of our buildings we strive to combine a memorable architectural appearance with clear functionality and aesthetics. 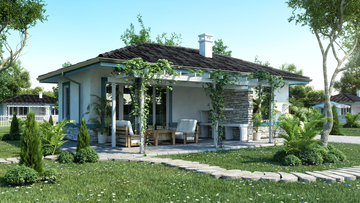 ISP Digital Design LTD carries out all activities related to the preparation of project documentation for investment projects, including: architecture, constructions, electrical, plumbing, heating and ventilation, geodesy, geology, health and safety, landscape projects, and technology projects. A full list of our services can be found on our services page. ISP Digital Design OOD was founded in 2003 by two architects with full architectural credentials and members of CAB, architects Ilian Petkov and Svetozar Petkov. Our consultant is Petko Petkov, who has many years of experience in contemporary architectural design. You can find additional information about our team on our About Us page. 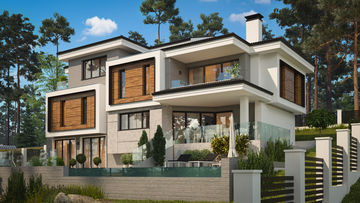 Here you will find ready-made projects of houses and villas which you can buy immediately. Take a look at the current projects with a discounted design price. Browse the latest completed projects of our architectural studio.